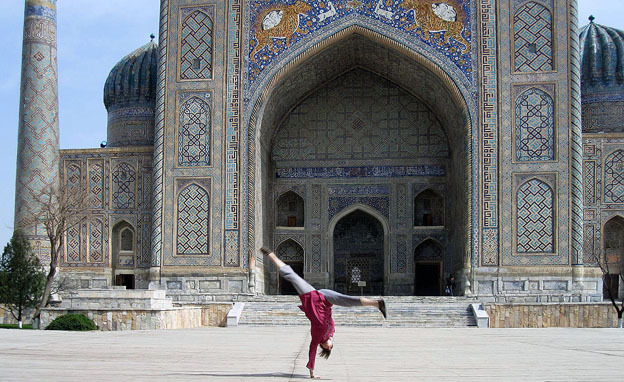 For the past decade, I've been wandering like a dervish around the globe -- trying to see things from a different perspective -- specifically, upside down. While some people fly or sail around the world, I'm trying to cartwheel across this great Earth. For the past decade, I've been wandering like a dervish around the globe -- trying to see things from a different perspective -- specifically, upside down. While some people fly or sail around the world, I'm trying to cartwheel across this great Earth. On occasion, I'll throw in a headstand or handstand--since each move has its own view. But there's nothing like a cartwheel. 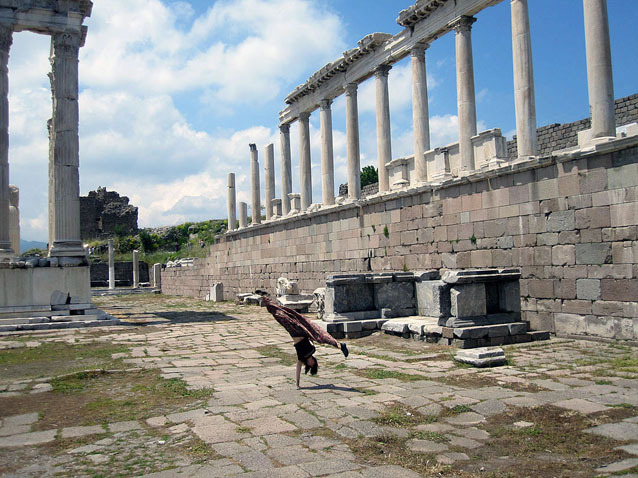 A cartwheel is, by its nature, a silly and spontaneous explosion of pure joy -- like in my picture above at Pergamon. 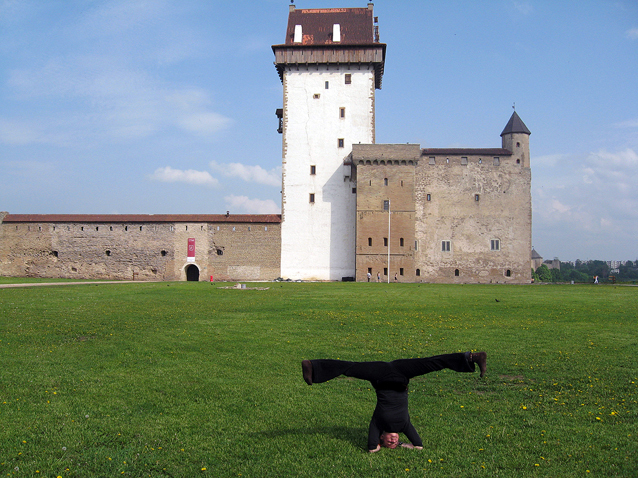 Think about it -- it's really hard to be in a bad mood, or take yourself too seriously -- when you're doing a cartwheel. For me, each cartwheel, like a mini-firecracker, is a hieroglyph of celebration -- an organic pick-me-up that instantly delivers a smile (to me and anyone watching). 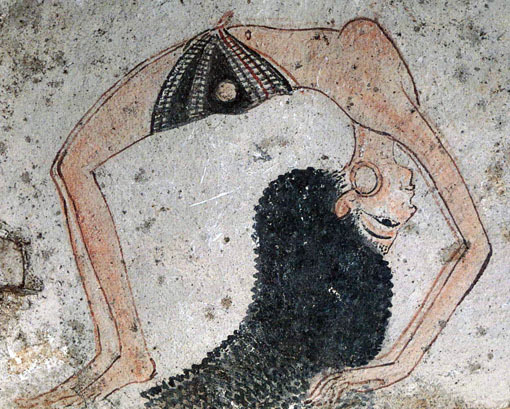 As an archaeologist and dancer, I like to think about how our modern bodies pass through the past. Do we shuffle through historical sites with the crowd, and snap the same conventional photographs? Or do we create a personalized digital griffito -- using not just the landscape as the canvas, but also our own unique and amazing bodies? How can we leave a creative trace of our own passage through history, with just a pose and a click? 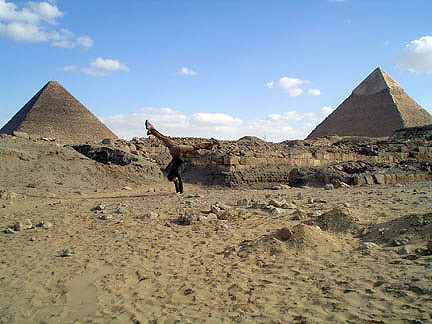 This whole cartwheel thing started at the Pyramids. My dream when I was growing up was to excavate mummies in Egypt. To my surprise, this dream came true when I was 20, and Brown University invited me to join their archaeological expedition at the Great Pyramids of Giza -- a gig of a lifetime that lasted for years. During lunch breaks, I loved practicing capoeira (an acrobatic Afro-Brazilian martial art) between the pyramids. Soon, my colleagues started snapping pictures -- an idea was born. Of course, people have been doing acrobatics in the Egyptian desert for thousands of years--and as I twisted and flipped each day under the Saharan sun, I imagined myself dancing and moving in concert with the ancient Egyptians who struck similar poses in the same sand several millennia ago (while apparently wearing gravity-resistant earrings). After Egypt, I found myself studying Russian in Russia--and getting in touch with my Slavic roots. 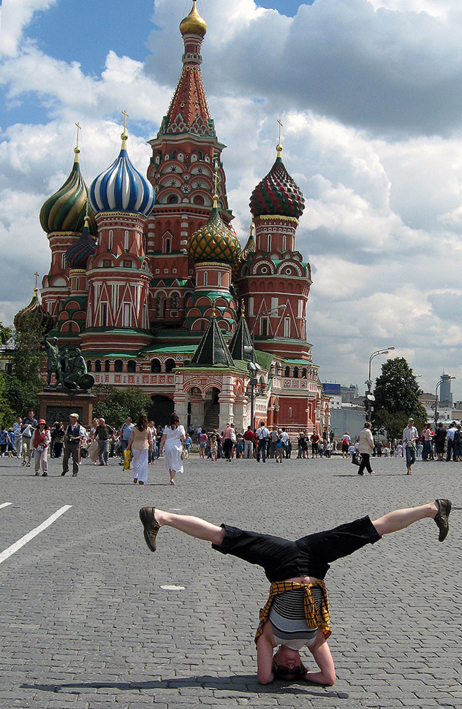 In St. Petersburg, I spent much of my time upside-down, training with a Russian capoeira group (talk about intense: one of the girls kicked the pants off a guy trying to mug her after practice--while in her high heels!). 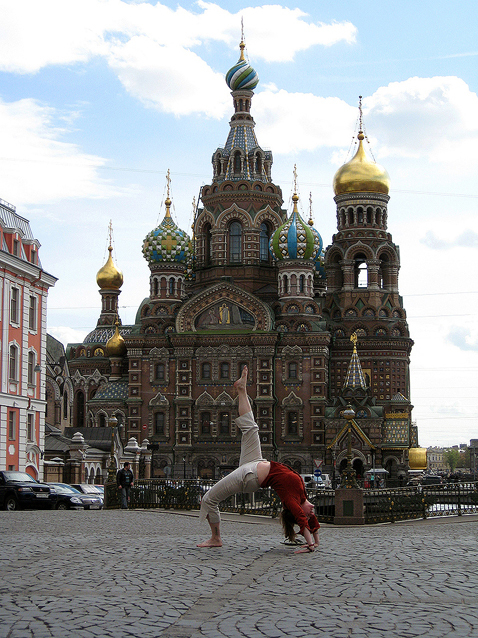 While diving backwards for this backbend on my way home from a Chekhov class one day -- in an attempt to mirror the onion domes on The Church of Our Savior on the Spilled Blood--the domes looked more like potatoes (some with spuds) than onions, which seems fitting--since the church received its nickname "Savior on Potatoes" after WWII, when it was used as a vegetable storehouse. When I joined fellow Russian students to cross overland into Estonia, it happened to be the week when ethnic Russians in Tallinn were clashing with police over a Soviet war monument--resulting in one death and numerous injuries and arrests. Though exhausted from our 8 hour wait at the border, I still felt compelled to contribute my own horizontal line to the facade of Narva Castle, after we crossed over. As I planted my head in the grass and lifted my legs to the sky, I finally felt free from the border bureaucracy -- a contemplative release which delivered much-needed peace in the fresh fields of that medieval fortress. 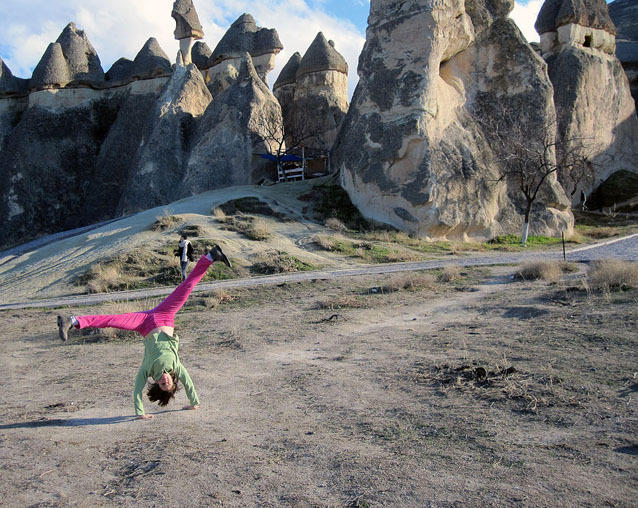 Whenever I do a cartwheel in Cappadocia, my sense of space and distance instantly collapses--since it's difficult to find a horizon line in that bewitching forest of fairy chimneys and caves. I'll never forget when my religious studies professor first showed us slides of these upside-down stone cones in Turkey, where early Christians hid from Roman persecution--and I thought, "I want to go to there." Now that I'm a professor myself (and leading tours to Cappadocia), I find that showing photos of my upside-down adventures to my students is a great way to get them engaged in the history behind me. Cappadocia's unique and surreal landscape is perfect for taking pictures in strange and unexpected poses. When I felt like adding a vertical dimension to this flat surface in Cappadocia's White Valley, I pulled out this capoeira pose -- but you'll notice I'm not entirely upside down (my head is turned sideways on the ground). With my eyes focused more on the dazzling white calcified limestone--instead of the natural obelisks reaching towards the sky -- I realized how many landscape details I had missed just looking up. The capoeira name that my Mestre gave me is Ligeira--which in Portuguese means light, quick, and nimble. I think it fits. I tend to spend a lot of my time these days in the 'stans--particularly Tajikistan, Uzbekistan, Turkmenistan, and Afghanistan. 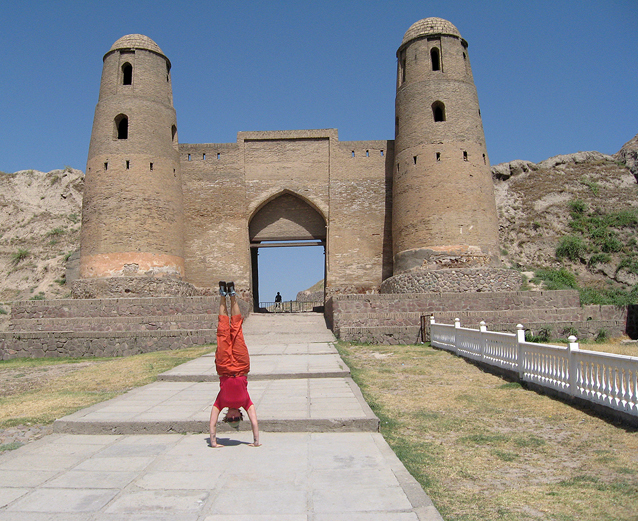 The first time I went to Tajikistan to study Persian and Tajik, I visited Hissar fortress -- and felt inspired to assume my position as its long lost third tower. Even though it was 103 degrees that day, I somehow managed to look upside-down at the town's medieval mausoleums and mosques below. 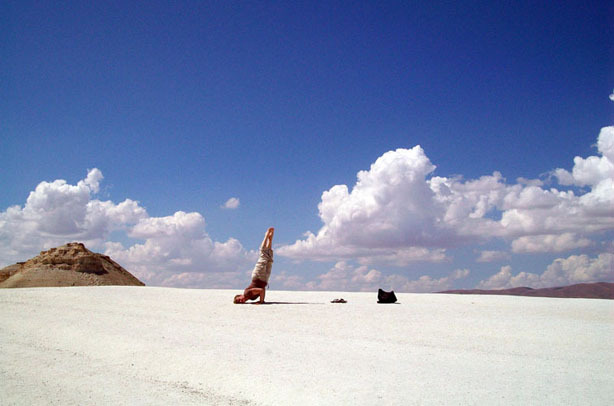 If you try doing a cartwheel or handstand facing forward--instead of looking at the ground--you'll understand why it takes so much practice to look straight ahead, and enjoy the view. On my first trip to Uzbekistan to study Uzbek fatwas and Sufi shrines, I was both surprised and mesmerized by the unusual presence of faces and animals on this front of this mosque in Samarkand's Registan Square. My Uzbek friend captured this one-hander on the first try--with the police standing nearby. As I dove into the cartwheel, I could see the police as more than just strict enforcers of order. I could view them as human beings--since they couldn't help but crack a smile. What can I say? I'm in love with the world, and grateful to have a body that moves. And while I'm still kickin', I'm just trying to see the world from as many different angles as I can -- even if that means standing on my head. Because I won't be able to do that--when I'm dead. While traveling the world is certainly a grand adventure, trying to see the world upside-down -- is an adventure all its own.